Did you know that our dear old ape Donkey Kong has a nigh-on angelic singing voice? Anyone who watched the absolutely bizarre television series from the 90's will know all about it, and now the non-believers will finally get a chance to hear it for themselves in full. Yes, in an announcement that will either delight, disgust, or confuse in equal measure, Phase 4 Films has announced that Donkey Kong Country - The Complete First Season, is coming to DVD soon. One of the most beloved video game characters of all time is swinging onto DVD! 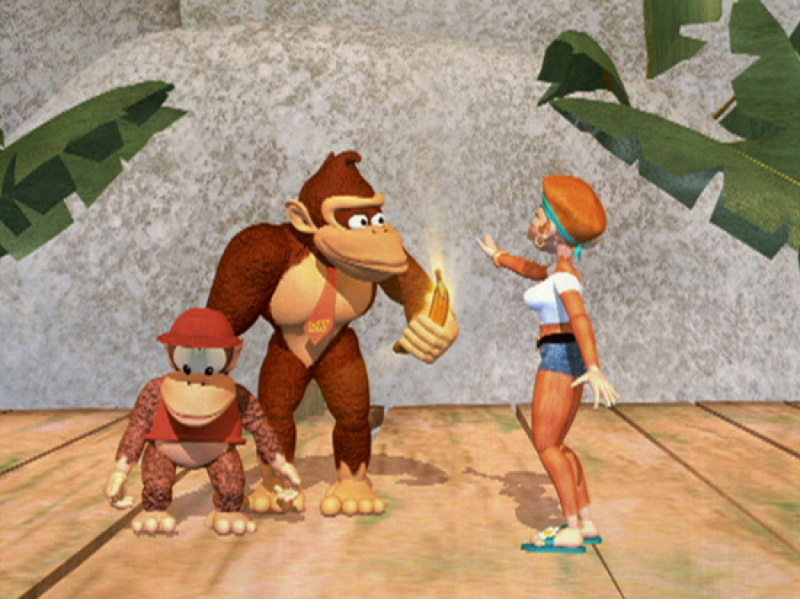 Donkey Kong Country brings all your favorite apes to life in stunning CGI animation. Join Donkey Kong, the peace-loving ape with a big heart as he teams with best-friend Diddy Kong to take on King K. Rool and his band of Kremlins. Includes all 26 episodes from season 1. The official description doesn't really do justice to the bizarre turns that the show takes at times, but it sets up a familiar background with plenty of recognizable characters all rendered in that "stunning" motion capture CGI. With wobbly and surreal visuals, a wild cast and a surprisingly varied soundtrack, there's an atmosphere to the show that simply needs to be experienced to be believed. Once you've seen DK transforming into a robot and singing a Daft Punk-esque riff, there's just no going back. The Complete First Season will swing by on May 12th, though has only been confirmed for Region 1 at the time of writing. If you're keen to add this momentous release to your DVD collection, then you can pick up the 3-disc set on Amazon for $34.99. Until then, check out the clip below and just try to convince yourself that it doesn't look like a good time. Make sure to leave your thoughts on a world where everything is a song cue with a comment! Wow, looks terrible, might have to watch a couple of episodes on youtube before I consider buying it. Nintendo, how about you bring all the Donkey Kong Country (including Returns) and Donkey Kong Land games to the NA Virtual Console first? To me, the show's okay. More watchable than the Super Mario Bros cartoon, in my opinion (and this is coming from a huge Mario fan). I remember this being on Teletoon years ago. It's very, uh... erm... it exists? I mean, back in the day it was fun. But considering it hails from an earlier CGI era... yeah. It's also sprouted a surprising amount of memes. There's no way I'm not buying this!!! The worst thing i ever saw. @schizor Megaman was the best in that show. That clip looks rougher than I remember the show being. Wish it was just on the new Anime channel for 3DS. @TantXL Haha I agree... I liked the Megaman episodes when they fight against CUT-MAN!!! Oh dear God, I don't think any amount of mind wiping will ever fully remove what I just saw in that video clip. And Nintendo are happy to allow this to be released on DVD? Surely they aren't that desperate! @StephenYap3 That's weird, I really enjoyed the Mario cartoons (or at least the SMB3 one). Huh, so that's what the cartoon looks like. The CGI looks like something out of my worst DK related nightmare. ...I must watch an episode of this series at once! Lol I was gonna say, even the TV series is getting released before we get the games on VC. Wow. Lol its coming out on my birthday. The animation,the look of this show i mean everything about it is so damn terrible!I love it! Hideous doesn't even begin to describe it. Also, why did Rare not contribute the official 3D models for this? The world may never know. @PvtOttobot Actually, I've been looking forward to that. This is literally the Worst thing I have ever seen. Well, this isn't the Donkey Kong Country announcement I was hoping for, but at least it's something. I'll get it for sure. A nice few memes came from this series....however it's something I wouldn't show here. I still have the VHS lol. To this day the song DK sung to Inka Dinka Doo is stuck in my head..... To know everything... You must give up. EVERYTHING. I just want my Reboot Reboot. Also, to be fair that "I'm going to be a star" clip is from the second season. The character design models were better in the first season. How many season where there, I don't remember it being on that long? I watched this when I was small. I don't know what to say about it other than that Conor nailed it when he talked about equal parts delight, disgust, and confusion. Good memories of a strange show. Love the meme, but not willing to pay for it. @HeroOfCybertron There were only 2 seasons of non stop in-your-face action, romance, and story. um how did I miss this during my childhood? I never even knew this existed! I never really saw this except King K. Rools amazing song mainly because this was born before me, but this is a must buy for some reason to me, despite terrible animations, but hey it was the 90's. Watched quite a bit of this show in the past, and it's actually not bad! Originally got into it ironically from the jokes surrounding it, but being a huge DKC fan already I ended up kind of liking it. The musical numbers, while admittedly seeming out of place at first, is not bad and sometimes even catchy. I can't afford to spend that kind of money when I can just watch the episodes on Youtube, but maybe some day. DK's voice sounds pretty weird, but it does look pretty decent so I may check this out once it releases. This show is terrible. Day one buy. But will he shower me with coconut cream pies? What, all of this and NOBODY has mentioned the absolute best part of the show? But hey, I'm up for anything that has to do with Donkey Kong Country. @Discipledoctor Seriously, I laughed outloud at that, silly as that may seem. do the crocs actually have tails in this one? The whole show is a Big Lipped Alligator Moment. Has a bunch of singing animals. The songs have little to no bearing on the plot whatsoever. After it's over, you never speak of it again. I watched it over and over, simply because it's somehow entertaining in a way. So...Kremlings are called "Kremlins" in this show? I remember being downright terrified of this show as a kid because it always seemed like the animation was broken, especially for K. Rool, and that is coming from a huge ReBoot fan. The animation reminded me of my fears of animatronics I've had decades before FNaF became a... thing. Wow I never knew Donkey Kong had such a great voice. What happened to it? Smoking much? @FLUX_CAPACITOR It's Kreml, actually. Don't upset Putin. ^_^!" The only reason kids would have watched this back in the day is because DK was very popular and 3D animation wasn't common. God, I loved this show when I was a kid, and I love it now just because of how charmingly STUPID it is in retrospect. :V You only get that kind of legit sincerity in 90s cartoons, if it was done now, it'd be for the sake of irony. @SmashMario That movie was the BEST! Not long since I even discovered this series. It really wasn't bad. ugh, that show was horrible!! They should release an entire boxset with all episodes plus the Saturday Supercade DK & DK Junior cartoons, instead of just releasing 1 season of this. That CGI has really aged horribly, though I can't imagine this looked good even when it was originally released. I don't see how anyone would buy this, except for maybe nostalgia reasons. I remember watching this most of the time after school back then (Fox Family before it was ABC Family). Never realized how incredibly cheesy (or musical) it was. I guess I never realized because I was excited there was another video cartoon on TV since Mega Man, which kind of proves @Dauntless 's point. Well, they're technically crocodiles, but whatever. I didn't even know that this show existed. It seems Nintendo tried their hand at making shows of most of their most popular characters. I wonder how they would turn out if they were to do the same today! If it gets to Europe, I can finally enjoy those ''stunning CGI animations''!!! I'm a huge DK fan, I'll buy practically anything DK-related. But this thing... never! We rented a Donkey Kong DVD about a year ago.....it was almost not watchable. The animation is horrible (although I'm sure it was considered great back when it was first released) and the stories are outdated. This did not age well. Watched this on VHS when I was a kid. It looks like a misguided tragedy of a show and I love it to bits. I used to love this show as a kid, I had a VHS of it. @Osiris11235 They did. They didn't bring returns, but the trilogy is still there. @Godlygamer I conclude that our collective psychic powers in between when this article was written and Nintendo announced the eShop lineup for NA this week brought this on! How have I lived 38 years on Earth, most of them a Nintendo fan, including a HUGE DK fan, and never seen this?! My DK club card must be revoked!! 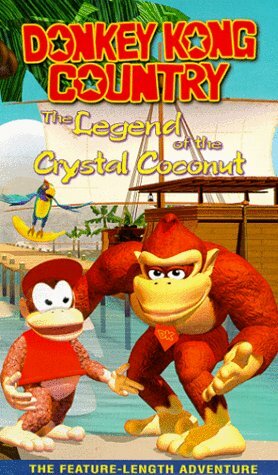 I vaguely remember this.... there was something about a crystal coconut and it was crazy. MUST WATCH AGAIN.